We recently took a boat trip to wonderful Skomer Island, an island off the coast of Pembrokeshire, here in west Wales. 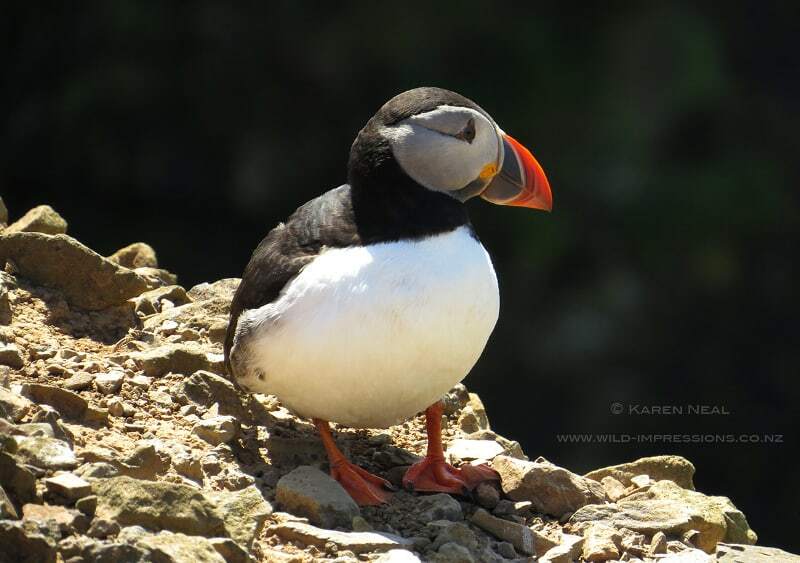 Skomer is known as one of the best places to see puffin worldwide, and we weren’t disappointed; there was literally 10’s of thousands of nesting pairs. Suitably inspired, I’ve been busy painting puffins ever since, using some of our photographs taken on our Skomer island trip for reference. 1) Here is the photograph I chose to work from for this painting, taken by fellow artist and puffin enthusiast Karen Neal. Photograph courtesy of Karen Neal. 2) First, I had to work out a composition and make a mock-up of my planed layout. I did that using GIMP ( a free software program similar to photoshop ) to clone a dark area of the background, and continued it across in an elongated shape to match the canvas that I already had in mind for this painting. Dark background put in using GIMP. 3) Once I’d worked out the composition, and painted the whole canvas with black acrylic paint, I just printed out my puffin mock-up image on a piece of A4 photo paper, using my ordinary inkjet printer, and worked from that image to paint what you can see here, in oils. First stage of the painting done. 4) After a little refining and a few more hours work I had what you can see below. Now, I was pretty happy with the Puffin, and fairly happy with the rocky area that it was standing on, but what worried me was the big blank area on the right. I hadn’t planned to paint anything in there, the idea being to leave it completely black, but after some reflection I decided to add another couple of smaller flying puffins. Black area on right looking a little empty. 5) Here is the finished painting, with the extra flying puffins added. I think the extra puffins flying in to join the other one works really well, and I’m very happy with the results. Extra puffins added – Finished painting, 100cm by 50cm, oil on box canvas. 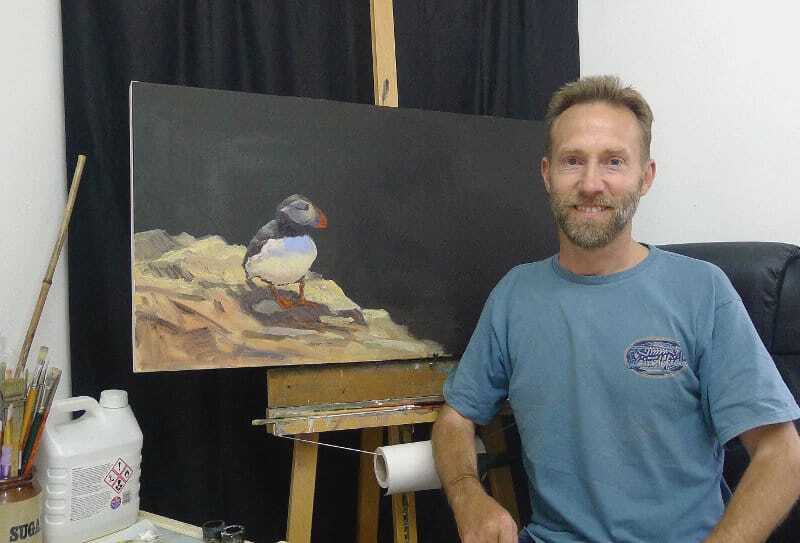 I look forward to hearing what you think of this puffin painting in the comments below.